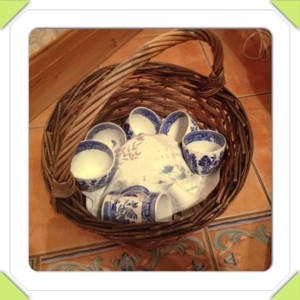 What a lovely surprise, to get home from work and find this- a Wedgwood tea set in a wicker basket. It belonged to my late aunt and I never knew it existed. It’s been hidden in someone’s cupboard for a few years and has come into my life at a time when I’m obsessed with tea and it’s history (I even got a book about tea for my birthday from my brother) so I’m absolutely thrilled! A girl can never have enough tea sets, especially one which holds great emotional significance. I often hear tales from my nana about how many of our family heirlooms got left behind in the family’s relocation from London to Hertfordshire. It’s a story which saddens me deeply. As a person with hoarding tendencies I know I would have kept and looked after everything, I’d want to know the history and I’d want to give it a future. Perhaps in time more secret family heirlooms will reveal themselves!